Project Pre Box DS2 Digital PreAmplifier with USB, Optical, CoAxial and Bluetooth. Available with Online Finance and Free Delivery. The advanced Pre Box DS2 Digital is an universal and very flexible pre-amplifier and D/A converter of highest class. The built in D/A converter AK4490, from high end manufacturer Asahi Kasai Microdevices, has five different digital filters which let you shape the sound to your preference. It offers full DSD256 support and upsampling of all input signals to 768kHz from USB, coaxial and optical inputs. This realizes high-resolution sound playback with a rich sound field and bass representation with less distortion. 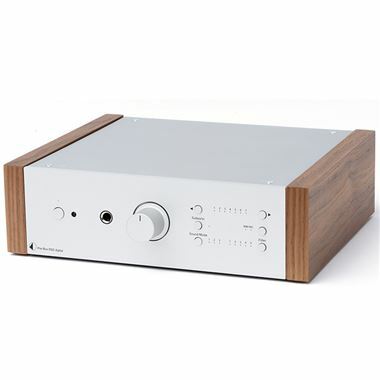 It features five digital inputs as well as analogue line level input and phono line in. The Bluetooth receiver supports aptX for best wireless sound conversion. That makes it suitable for any source available. One variable, one fixed analogue output and also one to connect the Pre Box DS2 Digital to your subwoofer are available. The samplerate converter (AK4137) features three different settings (sound modes). All that makes the Pre Box DS2 Digital the most versatile audiophile pre-amplifier D/A converter in its price range!